"I believe in truth and reconciliation." VIFF 2017—Arthouse filmmaker Sally Potter's very theatrically brisk film is an appealing if disposable tragicomedy of manners. 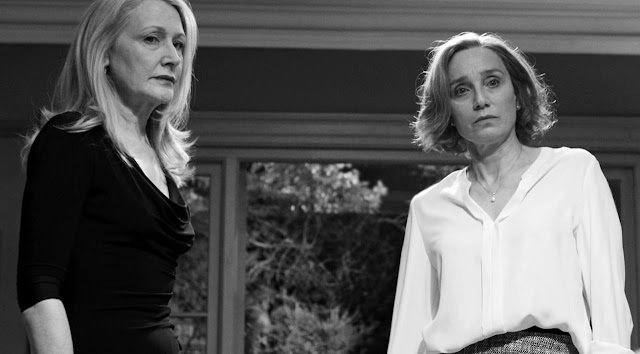 Set at the titular The Party hosted by Kristin Scott Thomas' tightly wound, but idealistic leftist politician, Janet, the black and white film oozes dramatic fun full of terrific performances doubling its title's reference as an encapsulation of post-Brexit British politics. Essentially a one-act play, the likes of Patricia Clarkson, Bruno Ganz, Cherry Jones, Emily Mortimer, and Cillian Murphy play the friends of Scott celebrating her newly minted status as the British Shadow Minister of Health alongside her comatose professor husband (Timothy Spall). Together the seven assemble various adulterers, a pregnant lesbian expecting triplets, her older much professor partner, a drugged out gunman husband, cranky American, and her new age German philosopher boyfriend. Clarkson, in particular, gets all the best lines spouting sharply-tongued nonsense to her best friend Janet as well as her estranged lover in Ganz. The drama, action, and comic wit unfold quickly in stagey fashion in the kitchen, living, room, and backyard. Scott's ably bright performance zigs and zags back and forth through mixed emotions to highlight the dark comedy with every turn. The Party is a tightly-wound, enjoyable 71-minute piece of entertainment designed to be somewhat immediately disposable while showcasing the comic and dramatic range of its immensely talented cast of mostly European actors. Potter shows her knack for constructing a rapid-fire situational dialogue and character interactions deftly. The Party screened at the 2017 Vancouver International Film Festival as part of the Panorama and Contemporary World Cinema streams.